How should I organize my accounts and campaigns? 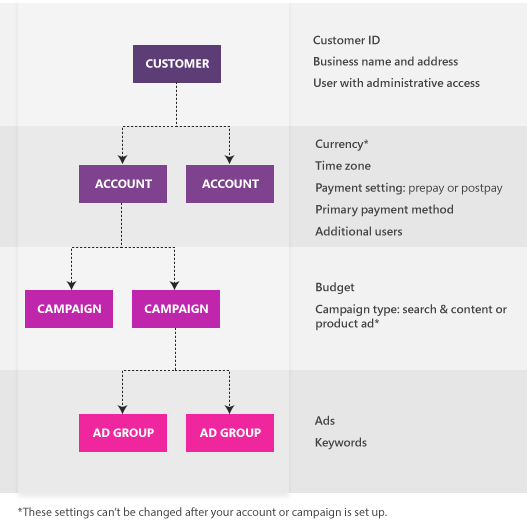 Find out how to best organize your accounts and campaigns in Bing Ads to get the most out of your advertising campaign. Learn about account limits, including maximum number of campaigns, ads, targets, and extensions. Getting the most out of your advertising campaign means understanding how Bing Ads is structured. Once you understand the structure, you can organize your accounts and campaigns in a way that makes sense for your business and in a way that gets your ads in front of the right people. 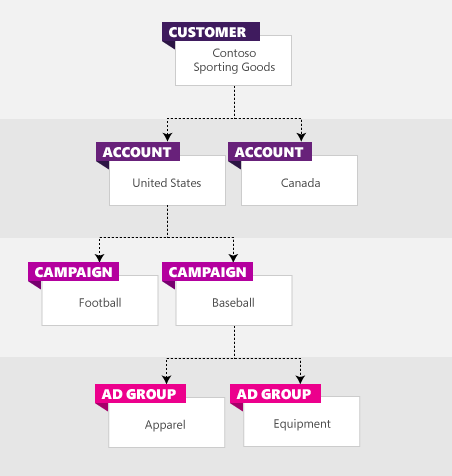 Bing Ads has four levels of organization: customer, accounts, campaigns, and ad groups. These four levels and their related components need to be in place to run your online advertising campaign. Accounts contain one or more campaigns and include information about currency, time zone, whether you want to pay in advance (prepay) or pay later (postpay), your form of payment (primary payment method), and the people who have access to each account (users). Campaigns contain one or more ad groups, which share a campaign budget. Ad groups contain one or more closely related ads and the keywords associated with those ads. A good place to look when you are organizing your ad groups is at the structure of your website, since it already reflects how you organize and sell your products. Are you a Google Ads customer? If so, the organization of your advertising campaign is essentially the same, except in Bing Ads you can have multiple accounts under one customer. Let’s say you own a sporting goods store and want to start an online advertising campaign. Since you have businesses in both the U.S. and Canada, you’ll set up a U.S. account (with U.S. dollar as your currency) and a Canadian account (with Canadian dollar as your currency). Having separate accounts will let you pay with different payment methods in different currencies. Creating online advertising campaigns is a lot like creating traditional advertising campaigns, you create campaigns around a particular product, set of products, or events. For your sporting goods store, you could have campaigns that are organized around specific sports (for example, football and baseball), and ad groups that are organized by product type (for example, apparel and equipment). Here is what the account structure could look like for your sporting goods store. Here are the limits on the number of items you can have at each level. This information can be useful in organizing your advertising campaigns, particularly if you plan on importing from Google Ads. These are the standard Bing Ads limits. Contact your account manager if you have questions about these limits.